We live in a big house in the city, with 12-foot walls, razor wire, a heavy front gate, a couple of security guys and a driver, and a good cook, Fariba. She has a cooking show on local tv, and she makes me eat my vegetables. I cannnot state enough how much this place needs a woman’s touch. It is like a fraternity house, minus the beer, the girls and the music. It is functional and well-stocked, but not presentable. It is an outpost. 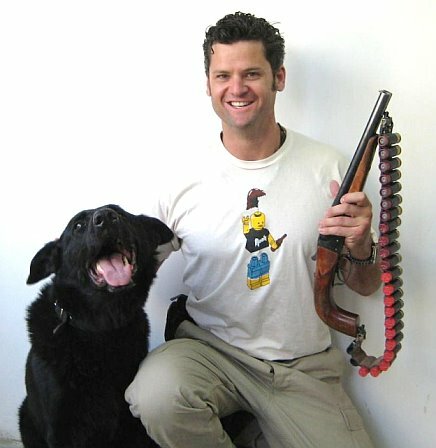 Grupp is a retired Afghan bomb-sniffing dog, a german-speaking black shepherd. The other is spring-tailed white lab puppy, never had a bath, does not have a name, and just as dumb as a bag of hammers. He will not leave ol’ Grupp alone and will probably pay for it someday soon. We bought the puppy from a couple of kids who had found him and were on their way down to the river to drown him. I cannot believe we interrupted that little venture. It cost us a dollar. Grupp was abducted recently, then the police found him and sold him to a dog-fighting enterprise where he did not fare well against a pit bull. My co-workers tracked him down and paid the ransom. Grupp sleeps in my room. We have modern electronics, communication and medicine. It is not obvious that westerners live here, and we try to keep it that way. There are a lot of weapons in the house and more on the way, but I do not think that we will actually need them, or else I would have left. The streets have no names, but I do not think U2 had this little circle of Hell in mind. Take a left at the mud house, go the wrong way on the roundabout, left at the tall mosque, down the broken road. My address? Street 4 Left, house #12 on the right. You can have that address when there is no postal service at all, just like on a submarine, a mine shaft, or a moon base. I do not know of another whole country that does not have a post office. DHL is the only service, but they will charge $380 for a shoebox full of stuff that I want, and then they will not actually deliver. I would have to go pick it up somewhere, which might be a big target. People have things hand-carried by others on their way in, or else have access to a military APO address. I am not sure yet. If there were a market full of things that we need, that might also be risky. Summer is high and the water levels are low; the capital city has about six hours of electricity, in the evening. Those fortunate enough to have running water have it only then, so water use is limited, everything is coated with dust and the smell is powerful enough to make my eyes water. Being outside mostly feels like standing under a hair dryer and clapping the erasers at the same time. Our latest medical transport was to deliver a guy with a stroke home to his village in Nepal, the one where Buddha was born. Not the best medical care available there, but maybe he just wanted to see the family and say hello to The Buddha before getting recycled to the next life. The airstrip is at 15,000 feet, servicing Everest Base Camp. I wish I had worked that one. Most of these trips are straighforward: business class to specialty hospitals or home in Dubai, Berlin, London, even Miami. We do not carry guns, so we are more cautious and inconspicuous, and maybe safer. There is another medevac company where the work involves pistols, body armor and bulletproof ambulances, but that changes everything, and I do not think I want it. If I did, then why not go work in Baghdad, too? Maybe survive and come back with a downpayment for a house. This type of work, this type of thinking is much of the contractor mindset here. One of the security guys I know just bought property back home. He plans to do five years here while his wife is in school, build a house and maybe retire. I will probably renew for another three-month rotation starting in October. Last week Pakistan blew up the Indian Embassy here in Kabul with a 2000-pound truck bomb, resulting in 60 dead and 140 wounded, almost all of them Afghans. We do not respond to public events, but visited the hospital later about taking a patient out of the country. “Wounded” is so vague: here it meant lots of partial people, bandaged and laid out in cots all over the lawn. We had to go through the landmine casualty ward to exit the property. Nothing newsworthy there – just the daily trickle of one-armed kids and legless farmers, sedated, glassy-eyed, alone. Their families cannot afford to come to Kabul. Not counting violence, the average life expectancy is 46! My co-worker watched a farmer screwing a donkey! All the young men here hold hands, kiss hello and dance real close! The wives and daughters are locked in the basement! Come along for a holiday! p.s. love the last half dozen photos…what a dichotomy.